Practical evidence was started as a means to get the important clinical policies and guidelines out there to the docs working in the pits. Journal publications do not address the learning needs of the current generation of Emergency Physicians. Asynchronous learning just makes more sense for our current lifestyles. Please click this feedback link and tell us what you think. 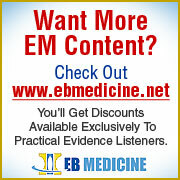 The bandwidth for the Practical Evidence Podcast is provided by EB Medicine. 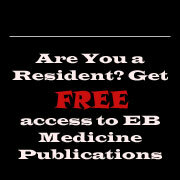 EB Medicine puts out some of the best evidence-based medicine publications for emergency medicine, emergency critical care, and pediatric emergency medicine. Click on the images below for great offers for Practical Evidence listeners.